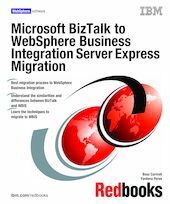 The purpose of this IBM Redbooks publication is to help the reader understand what is involved in migrating a BizTalk application into the WebSphere Business Integration (WBIS) environment. It deals specifically with migrating a BizTalk 2002 application into the WebSphere Business Integration Server Express (WBI SE) environment. It begins with a general discussion of business integration platforms, and migration drivers and issues relevant in the small to medium business environment. Several migration options are described and some basic migration techniques are presented. A comprehensive description of the BizTalk and WBIS platforms is provided, highlighting the similarities and differences between the two environments. A migration path and a set of best practices are proposed to migrate a BizTalk application into the WebSphere Business Integration environment. Finally, the detailed steps for migrating the functional and architectural components of BizTalk to the WBIS environment are presented. Readers are assumed to be familiar with the concepts of business integration and distributed applications, including multi-tiered architecture, synchronous and asynchronous messaging, transformations, content-based routing, and workflows. This book also assumes knowledge of cross-platform open standards, such as eXtensible Markup Language (XML) syntax and methods, Web Services Description Language (WSDL), and Business Process Execution Language (BPEL). This book is intended for both internal IBM employees and external IT personnel who intend to migrate a BizTalk-based business integration application into the WebSphere Business Integration environment.